1. Are you open during bank holidays? KKDC is open all year round and we only close on public holidays. 2. When is my child eligible for Nursery Education Funding? Your child will be entitled to the nursery education funding the school term after their 3rd birthday. KKDC is required to fill out a number of forms for submission to the Local Education Authority. We will apply for the funding on your behalf so you don't have to worry. Once you receive your first invoice when funding has commenced, this will be deducted from the fees and the number of hours of free entitlement will be shown. 3. When do I need to pay my nursery fees by? Nursery fees must be paid in full within 14 days of the invoice date. 4. Will you take my child out on any trips? Please contact the nursery manager for information on trips we organise. 5. How do I know what my child did at nursery each day? At the end of each day, your child's key worker will offer feedback about your child's day. For babies and younger children, this will include information about their sleep times, meal times and nappy changes. If your key worker is absent on a particular day, another nominated member of staff will be made available to share the information with you. 6. Can I bring a packed lunch in for my child? KKDC has a qualified on-site cook who provides freshly prepared meals daily and therefore we do not accept lunches or snacks brought in from home. 7. How can KKDC help with childcare fees? KKDC accepts vouchers from many leading providers, ideally Edenred/Accor, Computershare Voucher Services, Say Care Pass/Sodexho Pass, Busy Bees (including Leapfrog), Care-4 and Fidelity. If you will be using another voucher company, it is advised that you check with the nursery manager before you make your first voucher payment. As in question 2 above, grant funding will be available for your child the school term after their 3rd birthday. 8. My child has specific dietary requirements. 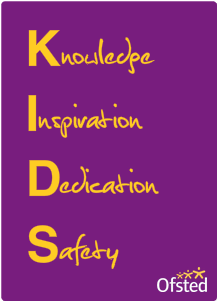 How can KKDC cater for my child? When you complete the admission forms, you will be asked to fill out any allergies, medication habits and dietary specifications regarding your child. Notification of any allergies and medication required will be passed over to your child's key worker and the rest of the staff working with your child before they start. The day your child starts, the nursery manager will once again brief the staff and cook about your child's requirements. A dietary list will also be handed over to our cook and this will be taken into account when preparing meals. We have some children that are vegetarian or do not eat pork or are allowed salt in their diet. This is absolutely fine and our cook will prepare a very similar dish to that of your child's friends! 9. I want to know what spaces you have available and discuss some requirements for my child. What is the best way to discuss this? Complete our online enquiry form and a member of our team will call you back. Alternatively, you can call us on 01296 489 876 and we will be happy to assist you. "If you want a wise answer, ask a reasonable question"